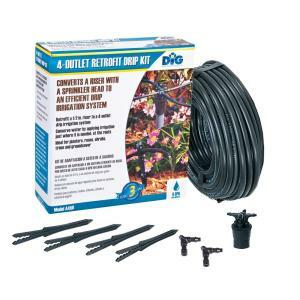 This easy to use Four-Outlet Drip Manifold Kit uses a four-outlet, high flow, emission device to retrofit an existing 1/2" MPT sprinkler riser into a four-outlet drip irrigation system without altering or increasing the flow of the sprinkler system zone. The four-outlet drip manifold has 1/2" FPT inlet and is pressure compensating. Operates between 10-50 PSI with an even flow rate of 6 GPH per outlet. 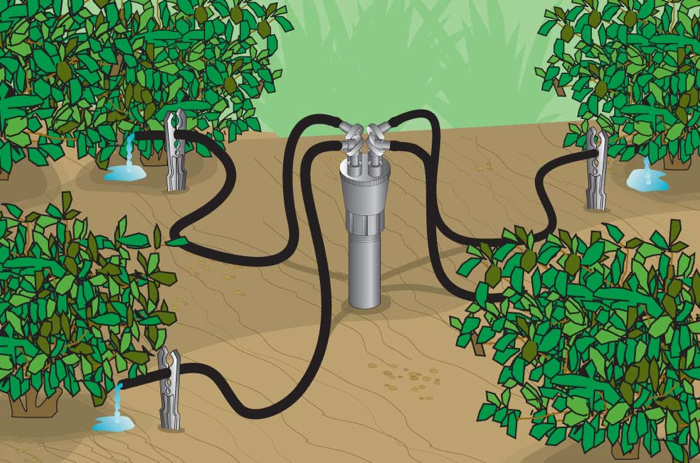 The manifold has four barbed outlets and includes 50' of 1/4" polyethylene micro tubing to deliver the water under your plants at the root zone. It can also incorporate 1/4" drip line or drip emitters with a maximum flow of 6 GPH if desired.